The ACWL is pleased to announce its 16th annual training course and looks forward to welcoming former and new participants. 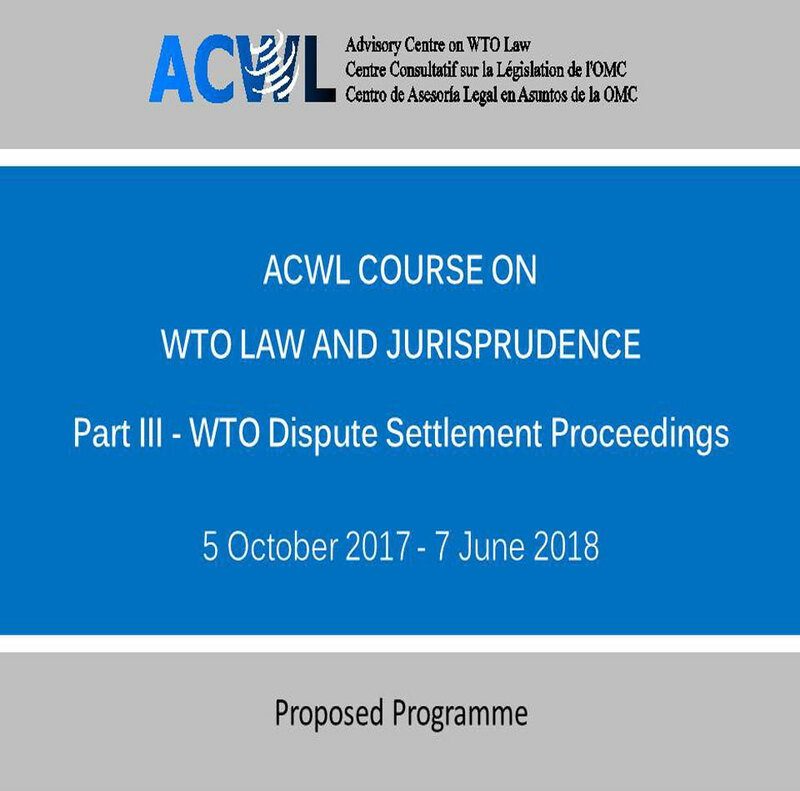 This year’s course is part III of the ACWL’s three-year course on WTO law and jurisprudence and will focus on WTO Dispute Settlement Proceedings. The course will start on Thursday, 5 October 2017 and end on Thursday, 7 June 2018. The course is designed for Geneva-based government officials from ACWL developing-country Members and from LDCs, particularly those delegates whose functions involve the legal aspects of trade policy. The sessions will be held on Thursdays from 13:30 to 14:45 at the ACWL’s Annex (35-37 Avenue Giuseppe-Motta, 1st floor). A light lunch will be provided starting at 12:45 each Thursday. The course will be taught by the Executive Director and lawyers of the ACWL. As in previous years, the course will include a moot court exercise, in which participants will take part in a simulated WTO dispute settlement proceeding involving some of the issues covered in the course. The proposed programme for the course is attached. It may be revised to take into account the wishes and needs of the participants. A Certificate of Attendance will be issued to participants that attend at least 20 sessions out of 27. In addition, participants that have completed the course may take an optional written (multiple choice) examination in June. An additional Certificate of Achievement will be provided to participants that are successful in the examination. Interested officials of ACWL developing country Members and LDCs should download the registration form below, complete it (attach a digital photograph) and return by email to secretariat@acwl.ch no later than 29 September 2017.